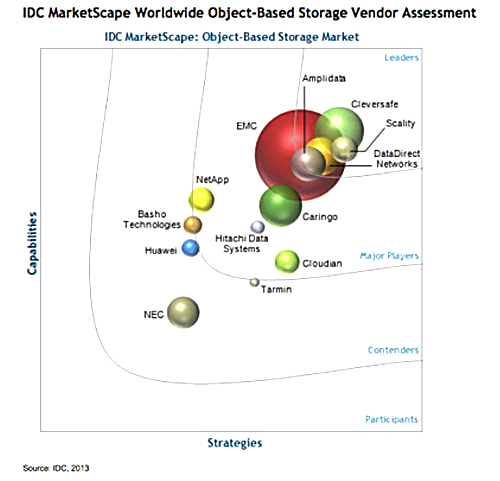 Analyst IDC has ranked object storage suppliers in a pretty 3D marketscape chart, and Cleversafe leads the pack. A marketscape chart, apparently, is a four-box diagram with wavy edges and overlapping boxes, labelled Participants, Contenders, Major Players and Leaders. It positions vendors on two axes; the upright one is capabilities (presumably low to high) and the bottom one is strategies (presumably crap to great). The Capabilities axis "examines how well a vendor has aligned its solution to market demand... Positioning on the x-axis (or strategies axis) reflects the alignment of the future strategies of the vendor and the vendor's corresponding OBS solution to forecast market demand (three to five years)." The object (sorry) of the exercise is to get to the top right corner, the leaders’ area. IDC says it uses rigorous scoring and much discussion with vendors to position them in its definitely-not-a magic-quadrant four-box square space. However, there is a massive puzzle here; why do the sectioned-off areas have parallel curved edges? We suspect it’s to point up the difference with Gartner's straight-edged magic quadrants – just marketing in other words. Anyway, on the chart from the “IDC MarketScape : Worldwide Object -Based Storage 2013 Vendor Assessment”, the size of a vendor’s circle indicates its relative market share. IDC says it adds a plus or a minus sign to each vendor to show whether it is progressing towards the leaders’ apex position or away from it. The example above comes from Scality, number two in the chart, and doesn’t include these signs of progress or lack of it. The leaders’ group consists of Cleversafe, Scality, EMC, DataDirect and Amplidata. EMC has the biggest circle and it overlaps, as does Amplidata’s into the Major Players’ section. Here we have these two plus Caringo, Hitachi Data Systems, NetApp and Cloudian to left and right of the main left-to-right diagonal, and Basho Technologies. The Contenders include Basho, Tarmin, Huawei and NEC. There is no vendors in the Participants’ section. In effect, we think, the marketscape is like a Venn diagram. Obviously all vendors in it are participants. All contenders and participants and contenders. All major players are contenders and participants and the leaders must be major players too … or is our logic breaking down? IDC mentions Exablox, Inktank (Ceph), SwiftStack, and Quantum in its report. EMC and its very famous Atmos, invisible in the market but driven by the world leader in storage, so we know why EMC is listed. DDN would disagree with that last statement and Amplidata would disagree with the first. Buy IDC’s 35-page report for $15,000. Download an extract from Amplidata's web site. It's only a 13-page PDF and includes a discussion on Quantum's OEM'd Lattus product, based on Amplidata tech.